Susan Gray is a writer/performer in Harrow, North London. 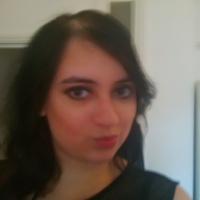 She is currently studying for her PhD in Creative Writing and Practice Based Research in Royal Holloway, University of London, researching the staging of Science Fiction in the Theatre. She is working on a portfolio of dramatic plays and monologues and has recently been writing and performing a series of SF monologues including the pieces Mercurial Harbour, Object meet Subject and 3 Degrees in various London venues. She blogs for Amazing Stories on SF and Theatre. This play was part of the Caged Season of Writers Bloc. The play dealt with a couple who are trapped in a virtual environment. The action keeps looping as the characters try to find the key triggers and plot points – but is it feasible? This full length play explores the notion of post apocalypse with the mapping of media influence and the societies that have developed from this series of incidents. A utopia/dystopia has been created as a result – but who is truly better off? This short play that I wrote and directed deals with the situations of two seemingly different lives coming together and interacting in the midst of a riot. I wrote and performed this monodrama with the soundscape composed by Lucy Harrison and recorded voice by Helen Burnell. This mixed media performance challenged the nature of reality by the unidentified object conversing with and informing the subject. An extract from my full length play was staged; an SF play where virtual spaces are stationed to back up lives for those who can afford it. A single mother comes under fire for preserving her children in stasis until she feels ready to look after them. A one act play about a woman who pays a corporation to mechanically resurrect her late husband for one day at Christmas. This is a comedy that parodies the ancient myth of Narcissus and Echo, exploring the nature of privacy and public life within a close relationship.